This press release was received today from Texas State Genealogical Society (TxSGS). 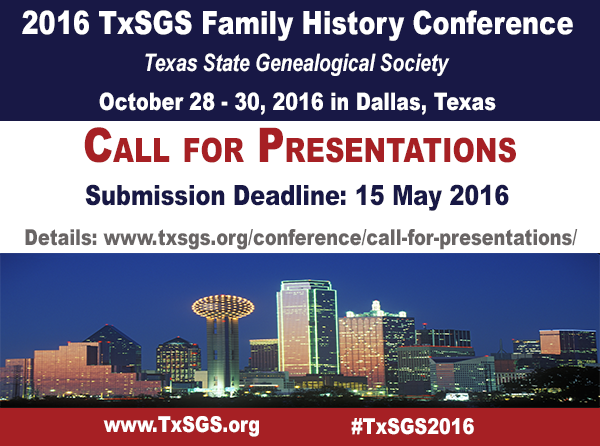 11 March 2016—Austin, Texas The Texas State Genealogical Society (TxSGS) announces a Call for Presentations for their 2016 Family History Conference. This year’s conference will be held 28-30 October 2016, in Dallas, Texas. The deadline for proposals is May 15, 2016. Presentations should be one hour in length. This includes any question-and-answer period the presenter may want to allow. Please send proposals in the following formats: Microsoft Word, pdf, or rich text format (rtf). File names should include your last name and title of lecture (example: Smith – Understanding DNA Results). 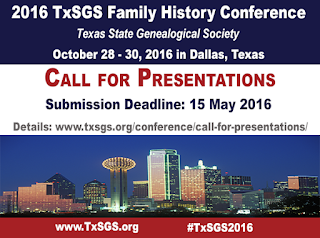 Email your individual proposals as file attachments to the TxSGS 2016 Conference Chair at conference@txsgs.org. Please send one proposal per email. Proposals must be received no later than May 15, 2016. TxSGS will provide a projector, microphone and stand. In addition each speaker will also receive a $150 stipend as reimbursement for expenses as well as a free registration to the conference. No other expenses will be provided or reimbursed. Meals that are included as part of the conference registration will be provided, as well as a ticket to the Saturday night banquet. If you have questions, please contact the TxSGS 2016 Conference Chair at conference@txsgs.org. Founded in 1960, the Texas State Genealogical Society promotes, assists, develops, and conserves the genealogical and historical resources of Texas. Keep up with the latest TxSGS 2016 Conference news! Debbie Parker Wayne, "Texas State GS Conference, Call for Papers, Deadline 15 May 2016," Deb's Delvings Blog, posted 15 March 2016 (http://debsdelvings.blogspot.com/ : accessed [date]). Genealogical Research Institute of Pittsburgh (GRIP) will open registration for its July 17-22 courses on Wednesday, March 2 at noon Eastern (9 a.m. Pacific). The registration page is at http://www.gripitt.org/?page_id=73M. Course descriptions are available at http://www.gripitt.org/?page_id=1900. Practical Genetic Genealogy for those with beginner / intermediate level DNA knowledge is described at http://www.gripitt.org/?page_id=1524, coordinated by Debbie Parker Wayne and Blaine Bettinger. Advanced Genetic Genealogy is described at http://www.gripitt.org/?page_id=1949, coordinated by CeCe Moore. Great location, (usually) great weather, dorm and cafeteria within feet of classrooms. What a great educational environment. Debbie Parker Wayne, "GRIP Registration Starts Tomorrow for July Courses," Deb's Delvings Blog, posted 1 March 2016 (http://debsdelvings.blogspot.com/ : accessed [date]).